Second level: 4 bedrooms with 2 bathrooms, plus master bedroom with balcony, bathroom with Jacuzzi and shower, ample walk-in closet, large living room area with fireplace. 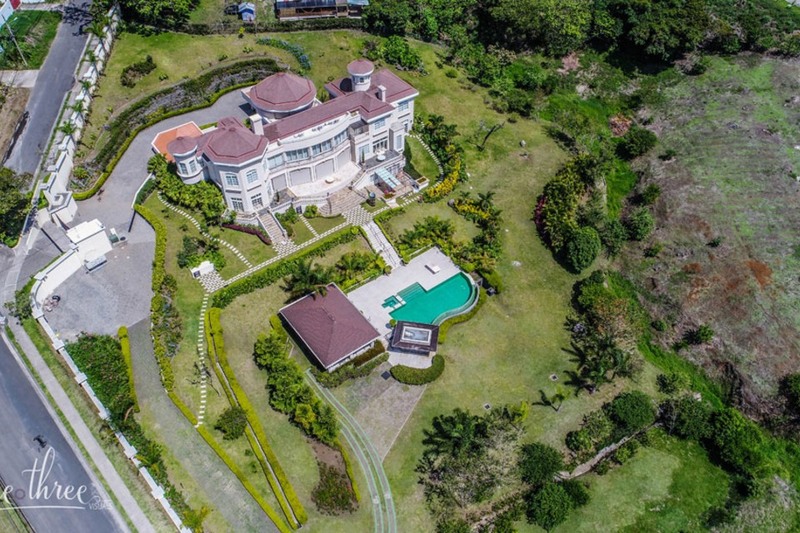 Brand New Mediterranean Style Mansion located on the Mountains of Escazu. Villa Serena is an unparalleled property that offers a restful escape in a majestic mountain setting. 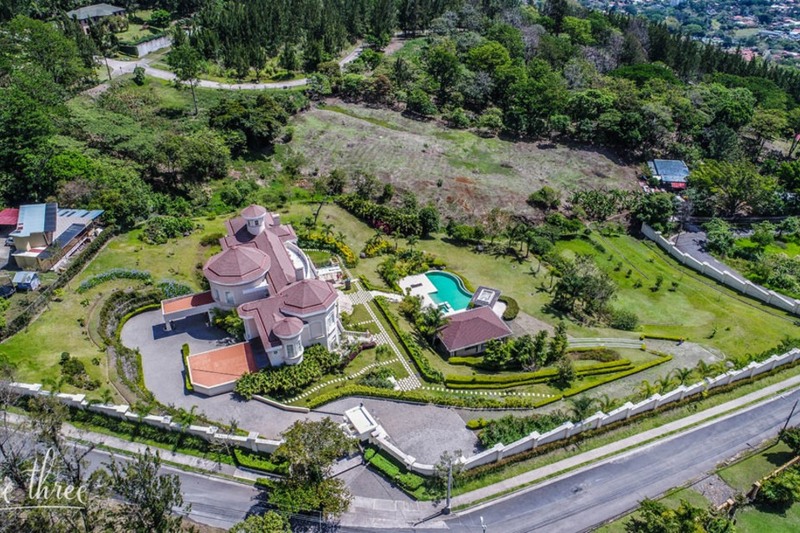 This elegant mountain home is nestled within a naturally spectacular piece of land atop the hills of Escazu, enjoying city and mountain views, and professionally landscaped gardens. 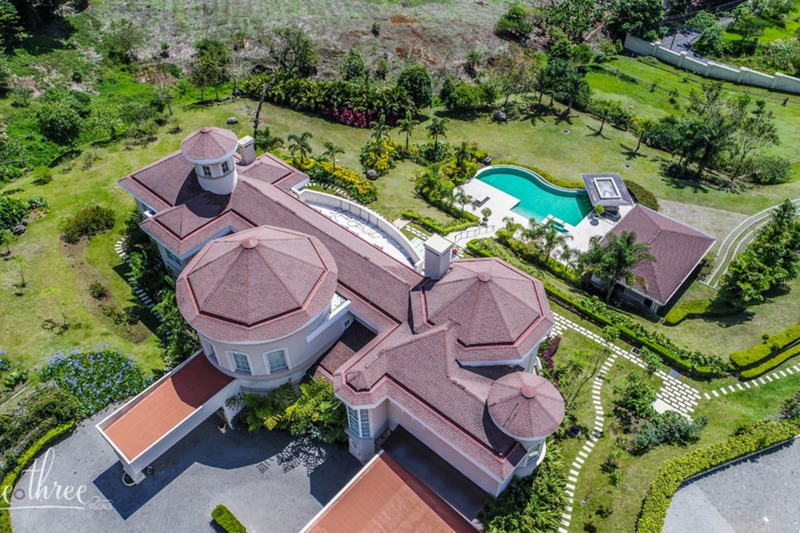 The elegance of this home is present not only in the exquisite finishes and furnishings but also in the beautiful views seen throughout its abundant floor to ceiling windows, which in turn, flood the residence of light and clarity. The property offers plenty of land for additional expansion. The spectacular gardens attract all kinds of butterflies and birds, and perfectly complement the house and social areas. According to the landscape architect, the landscaping for this project arose from the search for an identity, a personality in harmony with the architecture and the environment. The lobby area features an elegantly designed living space awaiting behind de grand door, opening to a double staircase crowned by a grand chandelier and exquisite marble and iron work. Other details include art work, sculptures, niches and cathedral ceilings at 9 meters of altitude. At the second floor we get another lobby which projects an exquisite green onyx table and the space opens onto a vast hall which was decorated with another collection of very fine furniture, art and beautiful fireplaces from Barro Baroque. This area offers a warm and functional environment to divide it into different functions that let you enjoy extensive social meetings and rest areas, next to the warmth of the fireplace. As part of the attention to detail in the furniture and decorations, the house includes exquisite embroidered chairs, corbels, Persian carpets and large sofas of qualified signatures as Ralph Lauren and Century. The interior design and decoration is a perfect blend of past and present, done by a professional interior designer. Through windows dressed in raw linen the visitors can appreciate the sublime views of the Central Valley. The formal living room of the residence is an open space which feels sober and relaxing, thanks to the neutral color scheme of the furniture. The entertainment areas are complemented by a fully equipped home theater. The main dining room is adorned by an original glass chandelier that perfectly complements the furniture in Art Deco style. The spacious kitchen is the dream of any chef. The quality is evident in the perfect distribution of space and vast areas covered with granite and marble. The space feels comfortable and familiar thanks to the warm scheme of selected colors in the decor. The master bathroom is bright and spacious, plating with the finest marbles with elegant furniture in cedar, plus a large Jacuzzi facing a window that opens onto the charming French-style gardens. The family bedrooms each have their particular style and restful colors. The outside covered errace is the ideal place for outside dining and afternoon entertaining to take advantage of the spectacular sunsets. A mirror of water whispers absorbing the scenery decorated with Ralph Lauren furniture, pieces of Global View and accents imported from Thailand. The view extends even further ... throughout the pool and rancho areas. An oversized terrace and large pool is the place for outside entertainment. The pool was designed by Ecopool. This area has independent entrance and parking for special events. The ranch is extremely comfortable and is equipped with all features for entertaining large numbers of people, as well the relaxing pool bar. 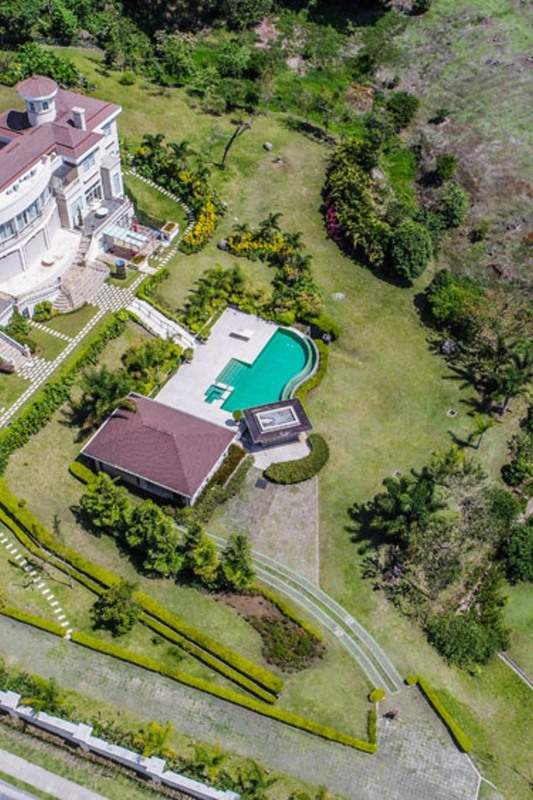 Ideally secluded and private, yet completely accessible, this mountain mansion is located at minutes distance from all of the first class services that Escazu and Santa Ana offer.